Woodturning artist Abe Sloan waited 70 years to develop a passion for making usable works of art from raw wood. Wood artist Abe Sloan didn’t find his artistic side until he retired in his sixties. Always attracted by the beauty of natural wooden objects, Sloan chose woodturning as his craft of choice. 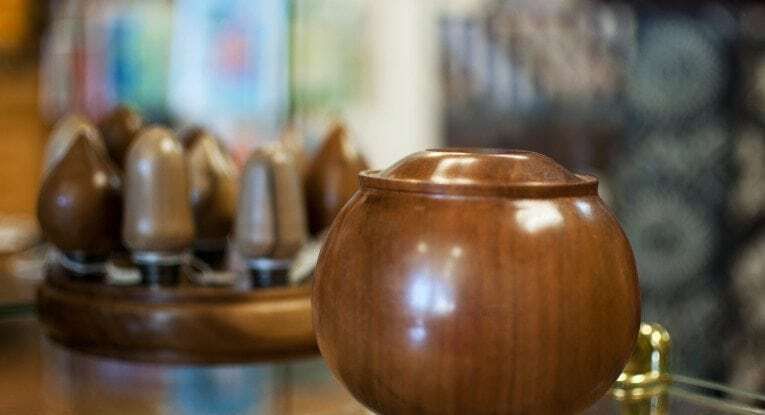 Woodturning, as its name suggests, is different from other kind of woodworking in that it requires the artist to cut the wood when it’s moving on a lathe. Sloan’s story tells us that it’s never too late to realize your dream. Here’s what Sloan shared about his work as a woodturner, his passion toward wood and his thoughts on making a living off the arts. How did you become interested in woodturning? In high school, my parents didn’t want me to take woodshop; they insisted I take Latin. Then I went on with my life teaching elementary school. When it came time to retire, I said, “What do I want?” I said, okay, I really like to work with wood. At the beginning, I was too slow. I began to learn how to use a lathe—I got a cheap lathe from a guy—and that’s how I started. Where did you learn the skills? I had an opportunity to receive formal turning instruction at Arrowmont School of Arts and Crafts in Gatlinburg, Tenn. I had three teachers, each one for a week: Dixie Biggs, Bobby Clemons and Alan Stirt. I also make use of instructional videos to approach new techniques. I also learned from local wood turners. We are all each other’s teachers. I start with a piece of wood. Every piece has its shape, color and grain. I put it on the lathe and make it into something rough, and then I send it aside to dry. Once it’s dry, I take it back, look at it and make the decision. My creative ideas come from the past 70 years of experience. It is hard to say what I see because I make judgments while working. The idea can change drastically. The craft is: can you make it, can you make it smooth and can you make it a pleasing shape? What happens next is all artistic judgment. It depends on what you’ve seen and what the symbols are in your culture. It depends on what I’m making. I’m currently working on a salad set. For salad bowls, I use cherry, maple or camphor. I wouldn’t use pine, because the smell comes through eventually. I try to make sure it’s going to be safe because people are allergic to different things. Maple, cherry and any fruit trees are fairly safe. What makes each type of wood different? There are common things about some trees. If I do cherry, they are all going to come out a lot alike. That’s another reason why I choose cherry to do bowl sets, because I will get a matching set of colors. Unlike cherry, camphor will turn out in different colors unless you cut it from the same log. Hackberry – locally they call it iron wood – would be pure white if it’s not too old. What’s important to me is grain and pattern, sometimes how thick or how hard the wood is. How much time you spend on a piece of work? It depends. Twenty minutes for a bowl. After making it, I take it aside for it to dry. You don’t want it to dry too fast, because if you leave it thick and it dries fast, it’s going to crack. If you cut it thin, it’s going to warp. Changing shape is okay, but people don’t like cracks. If I’m concerned about if it’s too wet, I put it in a paper bag or a plastic bag and let it dry. I keep weighing it. When it stops losing weight, it’s dry. Then I do whatever I want, carving or painting. I am now working to make one carved piece a month, and other than that, one or two bowls a week, a good amount of pens and wine plugs. I use the size of the piece and I multiply. If I do a piece that is six inches wide by three inches high, I multiply the inches, which will be 18. Then I multiply by two, or two and a half. So the price would be 36 to 45 dollars. I can’t, because I’m retired. But yes, you can make a living if you start early. The only way to get educated is to get free time. And once you get pretty good, you have to gain some knowledge about how to sell yourself. The way people do that is by teaching. I am really not good at teaching while working on the arts. I am just concentrating on the lathe—trying to keep my finger safe. I don’t have extra attention to talk about the process. You have the art part to think about, but you have to think about the business. We are like doctors; doctors have to think about the business. They cannot be just thinking about healing if they want to survive. But as far as I am concerned, unless I started very young and established a name for myself, I couldn’t make a living out of it.